A child who is supported in his/her musical study will love to learn! There are many simple things you can do to help your child succeed. One simple way to be involved is to provide a good practice environment. Provide a quiet place for your child to practice. Create an environment free of interruptions and distractions, such as vaccuming, TV, talking, siblings, etc. Keep an in-tune piano. An in-tune piano is a piano that has the correct pitch where all of the notes relate to each other appropriately. A piano should be tuned at least once a year, if possible. Contact a piano tuner to help you get your piano in top condition. Or, if affording an acoustic piano is an issue then the next best option is to provide a good keyboard with weighted keys and foot pedals. Make sure there is plenty of light available. Have a supply of pencils nearby. Store music books in a convenient place near the piano. 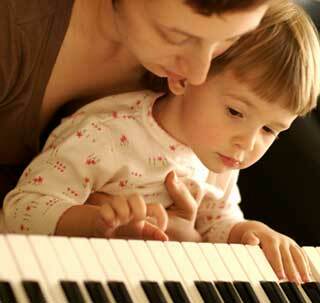 Consistency and support are the key to raising children who love to play the piano. Show up to piano lessons on time, and consistently attend. Check to make sure your child's music assignments are done before lessons. You can do this just like checking to make sure school homework is done for the next day. A little extra time and effort on your part will make a world of a difference in your child's progress. One of the best things you can do is to help your child set appropriate goals, and then provide a reward when he/she achieves those goals. No musical experience is required - the answers are on the back of the cards! Spending only 5 minutes a day (or less!) on flashcard drills will dramatically improve your child's chance of success. Create motivational opportunities for your child. Click here for ways to motivate your child. Click here for a list of game ideas that you can play with your child.